In a practice that appears to go back as far as 2016, the ISO 9001 and AS9100 certification body (CB) NSF-ISR has included language in its quotes and contracts which give the registrar the right to charge $90 for each audit “CAR” (corrective action request) filed. The practice had been attempted by registrars in the earliest days of ISO 9001 certification, and roundly criticized as a means of monetizing findings, and creating an artificial incentive for CB auditors to write bogus findings. It was thought that the practice was dropped entirely. 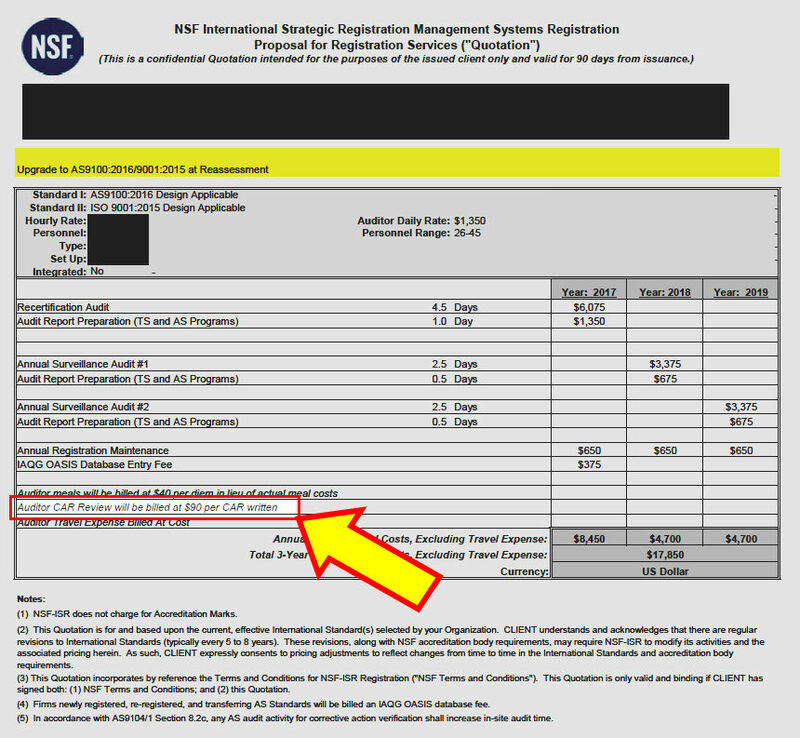 In a 2017 quotation submitted to an Oxebridge client, the NSF-ISR quote requires the client to agree a requirement that “Auditor CAR Review will be billed at $90 per CAR written.” Those conditions then become part of the legally-enforceable contract between NSF-ISR and the clients who sign it. Oxebridge has since reached out to its clients who opted not to hire NSF-ISR and confirmed that this fee was a partial reason for that decision. Ironically, NSF-ISR is on the receiving end of criticism for not writing audit nonconformities, even when they are known to them. The US Dept. of Defense’s Inspector General reported that it found 75 AS9100 nonconformities at SpaceX, of which 33 were classified as “Major,” and yet SpaceX held an AS9100 certificate from NSF-ISR at the time of the DoD audit. The audit was conducted between June of 2015 and March of 2016, and then published in December of 2017. 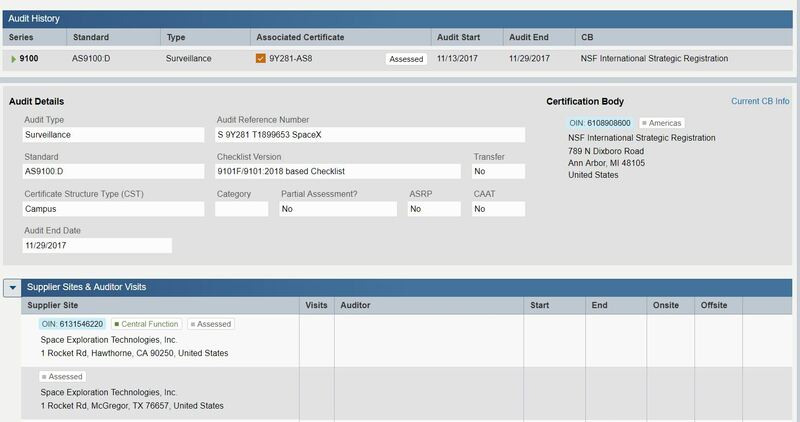 SpaceX’s last NSF-ISR audit was, according to OASIS data, in November of 2017, and resulted in NSF-ISR continuing to award SpaceX with an AS9100 certificate. While it was likely NSF-ISR was not aware of the DoD’s findings, since the final report had not yet been published, NSF-ISR nevertheless failed to independently notice any of the 75 nonconformities found by DoD. Furthermore, despite the widespread publication of the DoD report since, and the detailed listing of AS9100 nonconformities, OASIS records show no special audit launched by NSF-ISR nor mandated by ANAB to investigate the nonconformities, and SpaceX’s accredited certification has been maintained without any interruption. This should not be possible under the accredited AS9100 scheme. IAQG OASIS data for SpaceX as of August 28, 2018. Click to enlarge. The disparity between the $90 per CAR fee, and NSF-ISR’s SpaceX woes, points to an inconsistent policy that remains unexplained. Senior management of NSF-ISR did not respond to a request for clarification on this policy. ISO 17021-1 accreditation rules demand that CBs treat clients equally and show no favoritism; there is no provision to charge extra for audit nonconformities. Oxebridge is calling on NSF-ISR to cease the practice of charging for CARs immediately, and to add a uniform “audit processing fee” to all clients, across the board, if it feels doing so is necessary. This charge would cover the processing of CARs as well as any additional post-audit processing, while removing the appearance that NSF-ISR is using the filing of CARs to generate additional revenue. Oxebridge readers are urged to check the fine print in registrar contracts for hidden fees or curious policies, and change registrars if they find any such language that they feel does not serve their interests.